December 7, 2011 - Northrop Grumman delivered to NASA the flight software that will enable the James Webb Space Telescope to communicate with its ground station nearly a million miles away after it passed formal verification testing. The company is leading the telescope's design and development effort for NASA's Goddard Space Flight Center in Greenbelt, Md. 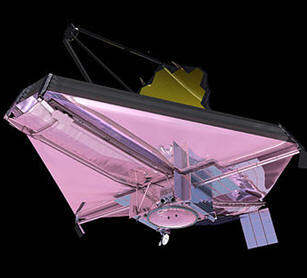 The spacecraft program has also completed critical design reviews that represent substantial progress for the bus design. These include the primary structure that supports the observatory during launch and operations. This 350 kilogram graphite composite structure is designed to support 6.5 metric tons, the propulsion structure module, which supports the spacecraft propulsion subsystem responsible for orbit insertion and maintenance and the cone assembly, which mates the primary observatory support structure to the Ariane 5 launch vehicle. In addition, technical progress continues on several other major components. A critical design review confirmed a thermal upgrade to 16 monopropellant rocket engine (MRE-1) thrusters which were modified to withstand the high temperatures on the spacecraft generated by both the sun and reflected heat from the sunshield. The 6-inch long MRE-1 thrusters provide one pound of thrust each to unload momentum and provide precision attitude control on orbit. Propulsion engineers have also completed building four flight Secondary Combustion Augmented Thrusters, which provide eight pounds of thrust each and supply orbit maintenance after the launch vehicle finishes its burns.